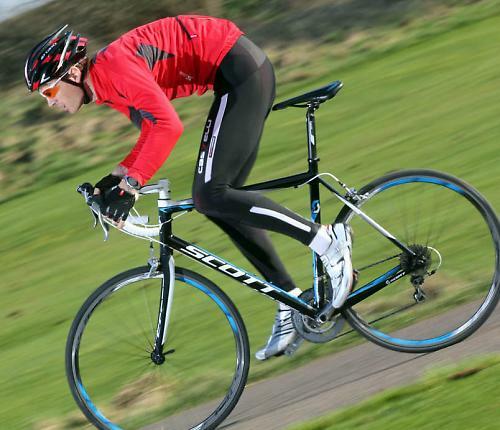 The Scott Speedster S30 is an efficient road bike that you should definitely consider if you're after a sub-£1,000 setup. The price band just below £1,000 is a competitive one. The manufacturers know a lot of people can justify spending £900-and-something on a bike but over £1,000? It's a psychological hurdle, a step too far. The £1,000 mark is also important because Bike to Work schemes max out at a grand. If a bike is priced at £1,001, it's not an option for a large proportion of the bike-buying public, so manufacturers set their RRPs accordingly. The frame is made from 6061 double-butted alloy and it's neatly put together. It's not a feature-packed frame with loads of shaping here, there and everywhere, but that's not a bad thing. The tube profiles are mostly – wait for it – round. Crazy! It'll never catch on. And the seatstays are – wait for it – straight. The welds are tidy enough and the paintjob is good, and you get little pip on the right-hand stay for hanging your chain on when you take the rear wheel out, saving the chainstay from scuffing. 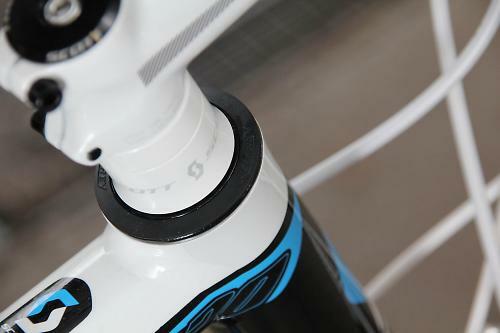 You also get an eyelet above each of the rear dropouts for fitting a mudguard or rack. Out on the road, there's little apparent flex in the frame even when you sprint for road signs against your ride-mates. It's the same story with the carbon leg, alloy steerer fork that does its job commendably well. I found this bike comfortable too. The ride position is a little more upright than I'm used to, but really just a touch. The S30s top tube is a smidge shorter than Scott use for their high-end road bikes, but there's not much in it. We have the XL/58cm model on test and that comes with a 575mm top tube compared to 580mm on a racy Foil. The S30's head tube is a touch longer but, again, there's not all that much in it: 190mm against the 180mm you get on a Foil. With the headset spacers taken out, I could sort out a low ride position – which is what I like. So, although Scott have made the setup a little less extreme than on their pure race bikes, they've not turned the S30 into a sit-up-and-beg leisure bike. You still ride in a quick, efficient position. I got on well with Scott's own Road Team saddle too. Own-brand saddles, which you usually find on bikes at this price, can be a bit hit and miss. Actually, saddles in general can be a bit hit and miss; what suits one rider perfectly can be hell on rails for someone else. This saddle has fairly deep cushioning, which I'm not generally into, but the slim profile and just-right amount of flex in the shell are great... for me, at least. 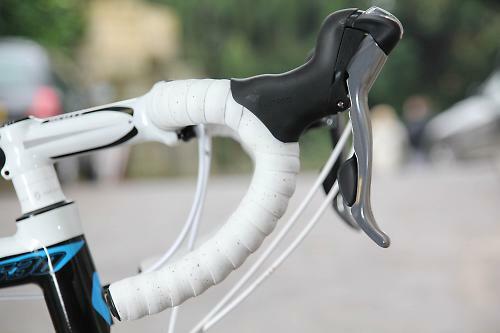 I like the anatomic bend on Scott's alloy Pilot Pro handlebar too. I find a traditional curve a bit tight but the straightened out section behind the brake levers here is bang on. The generous amount of rearward sweep is welcome too; it means getting down on the drops feels less of a stretch. I've got in a whole lot of miles on this bike during testing, including several long days in the saddle, and I've felt comfy throughout. Comfort has certainly never been a limiting factor here ... and that means you can just get on with enjoying the ride. Survey the market and you'll see that most road bikes priced just below the £1,000 mark come with a Shimano Tiagra-based spec and some own-brand components thrown in to keep the price down. The S30 is fairly typical in having shifters, mechs and chainset from the Tiagra range with own-brand brakes, and no-name hubs matched up to Alex rims. Tiagra is Shimano's fourth groupset tier (after Dura-Ace, Ultegra and 105; I'm not counting the Di2 electronic stuff here) and it has had a major redesign for 2012. 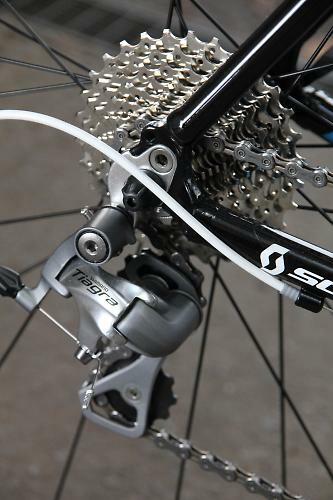 The big change is that Tiagra has moved from 9-speed to 10-speed to bring it in line with the higher-level groups (for the time being, until Dura-Ace goes 11-speed). 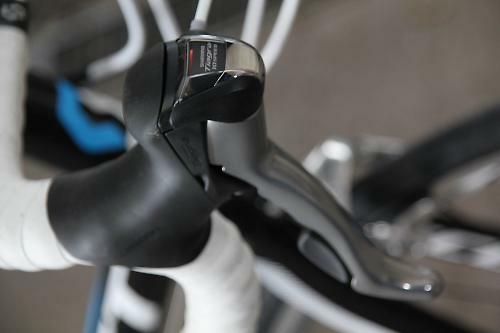 The shape of the Tiagra shifters has been altered to mirror that of the more expensive options too, and they're reach-adjustable for smaller hands via shims. Unlike those other Shimano options, the gear cables run externally rather than underneath the bar tape but that was the case right up to Dura-Ace just a few years ago. Scott don't include barrel adjusters up by the shifters to allow you to fine-tune cable tension on the fly, and there are no adjusters at the head tube cable stops either. That means that if your gears go slightly out of sync you have to stop and fiddle with the barrel adjuster on the rear mech... although, once set properly, they tend to behave themselves. The Tiagra chainset is a compact – it has slightly smaller than standard 50-tooth and 34-tooth chainrings – and you get a wide-ranging 12-30T cassette at the back. That 30T sprocket is a whopper that'll take the pain out of most hills, even if you're not a particularly strong climber. You might not get to the top very fast in such a small ratio, but chances are that you will get there in the end. The overall impression of new Tiagra is that it's solid and reliable with an up-market feel. It's a little heavier than Shimano's top groupsets but in terms of performance it's not a million miles behind them. I'm not sure I'm down with the little optical display in the shifter that tells you what gear you're in – some people like it, some people don't – but taken as a whole it's great stuff and extremely good value. Every bike has compromises, especially if a manufacturer is working hard to make a price point. 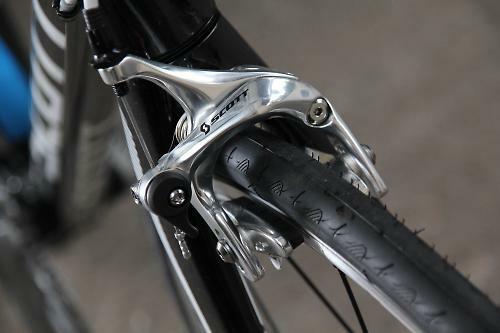 The S30, like many other sub-£1,000 bikes, comes fitted with Scott's own-brand brake callipers, for example, rather than sticking with the Tiagra theme. Scott's new Pro SCBR-525 dual pivot callipers are actually surprisingly good, providing a pretty strong bite. When you have to stop in a hurry, the limiting factor is usually the amount of grip the Continental Ultra Sport tyres have on the road rather than the amount of power provided by the brakes... or, at least, it is when the Tarmac is just the slightest bit damp. I didn't find myself wanting more oomph on the descents. The wheels are another common budget-making compromise on bikes at this price. Some brands spec Shimano's cheaper options, Trek use wheels from their own Bontrager range while Scott, in common with lots of other manufacturers, go for no-name hubs and Alex rims. They're not particularly great wheels but they're fine. The loose bearing hubs have spun smoothly throughout the test period, but you'd expect that. Despite seeing plenty of action, both wheels have stayed pretty straight too – not perfect, but not far off. I've not had to take a spoke key to either. They're fairly heavy, though, the Race28 alloy rims – which are actually 27mm deep – adding quite a bit of rotational weight. 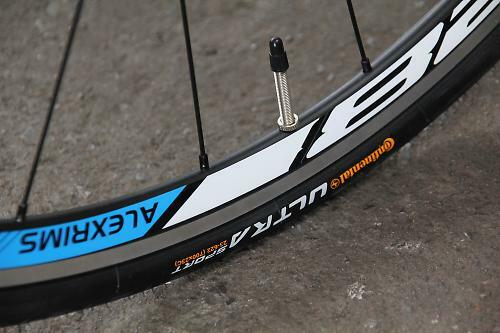 The wire-beaded Conti Ultra Sport tyres aren't light either. That said, there's enough tread here that they should last well. 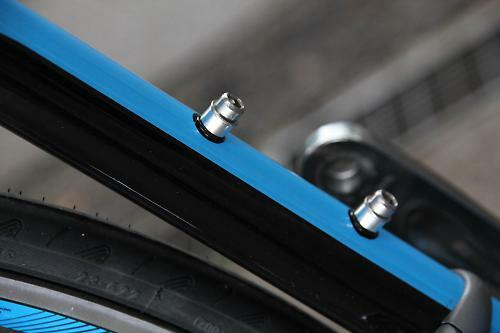 And, although these don't boast any particular puncture-prevention features, I've had no flats with these. Of course, I might just have been lucky. You notice that weight most on the climbs where the wheels lack any great sense of urgency. They do the job but they're not a particular highlight. This is a very good bike for the money and I enjoyed it immensely. Obviously, this bike isn't as light as something twice as expensive which means that winding up the speed takes a little longer, but it's an okay weight and it certainly feels like a proper road bike. What do I mean by that? I guess the main things are that Scott have stuck with an efficient geometry and the Tiagra components function a lot like Shimano's high-end kit. If I was spending £1,000 on a road bike, this one would certainly be on my shortlist. 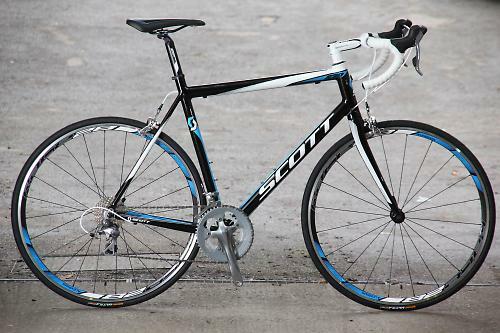 Scott say, "The Speedster bikes are economical, lightweight and efficient. The shape optimized double-butted alloy tubing and proven geometry provide comfort and great handling. The Speedster line features replaceable derailleur hangers and durable components to ensure long life and excellent value." It's an alloy road bike for all kinds of roadie action: sports/fitness rides, sportives, long commutes... going quick on the road, basically. The welds are neat and tidy, the paint job is good... nothing to worry about there. The frame is 6061 alloys that's double butted to save weight. The fork comes with carbon legs and an alloy steerer – that's nearly always the case on road bikes of this price. It's a fairly traditional road bike geometry with a slightly more upright ride position than Scott's full-on race bikes. The ride position of the Speedsters is the same as that of Scott's carbon CR1 bikes and slightly shorter and slightly higher than that of the Foil race bikes. Scott haven't ditched efficiency though - this is still an efficient ride position. I found it comfortable, partly because I liked the ride position, partly because I got on well with the saddle and shifter hoods, and partly because I didn't feel very much road buzz. Yes, efficient - I didn't notice any particular flex at either end. Not on this 58cm model. How would you describe the steering? Was it lively, neutral or unresponsive? Fairly normal for a road bike of this kind. It's not as light as many bikes and that dulls the acceleration a bit. Fitting lighter wheels would certainly add more speed off the mark. New Tiagra is great stuff: solid, reliable, slick. Top performance for the cash. They're pretty much straight and true still, and the bearings are going well.